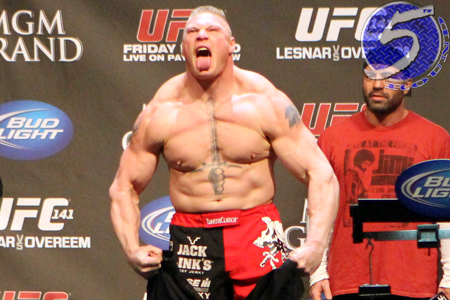 We’ve got some great news for you Brock Lesnar (Pictured) fans, albeit in a drunken late night state, UFC president Dana White said he will allow the former WWE superstar to return to his fake fighting roots. The bad news for Lesnar’s fanboys, longtime pro wrestling guru Jim Ross believes the chances of Lesnar coming back to the squared-circle ranges between slim and none. “Will Brock Lesnar return to WWE full time or part time? For those that know Brock well, the answer to this question is actually quite simple. It’s NO,” Ross wrote in his blog. “Brock dislikes, putting it mildly, traveling. Plus, he doesn’t need the money even though he’s smart enough to not turn down a big payday if the lay of the land is to his liking. However, not all is lost according to Good Ol’ JR. While Lesnar becoming a mainstay on the WWE roster remains a longshot, Ross does believe that a special extravaganza could bring him out of wrasslin’ retirement. Just don’t hold your breath. White refused to clarify exactly what “retires under contract” meant, nor did he specify how many fights Lesnar had remaining on his UFC deal. According to the video below, Lesnar is now free and clear to rejoin White’s pay-per-view rivals if he so desires. Although, agreements made while intoxicated rarely hold up in court. Either way, it seems like a moot point if you were to ask JR.